For organization’s sake, you might consider making a subfolder called eBay Photos in your Pictures folder. That way you can always find your eBay pictures quickly, without searching through photos of your family reunion. eBay offers two versions of image uploading. The Basic version enables you to upload eBay-ready images as they appear on your computer. If you want to rotate or crop the picture, you need the Standard uploader. When you reach the part of the listing form that asks you to add pictures, notice the Add or Remove Options link. Clicking this link causes a window to pop up. 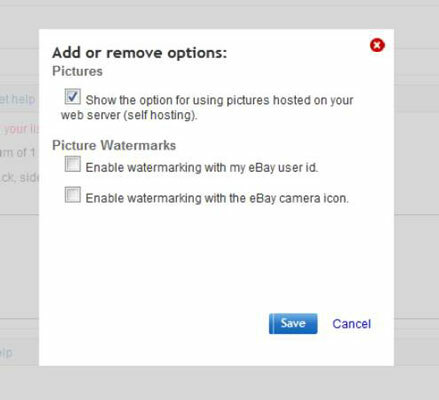 Select the check box next to Show the Option for Using Pictures Hosted on Your web Server (Self Hosting) if you need more than the 12 pictures that eBay will host for you. If you want your uploaded images to be watermarked with your eBay User ID or camera icon, select those options as well. Then click Save. Clicking the Add Pictures button opens a Select Pictures for Upload window. Click the Browse button to open a window showing your hard drive’s folders. 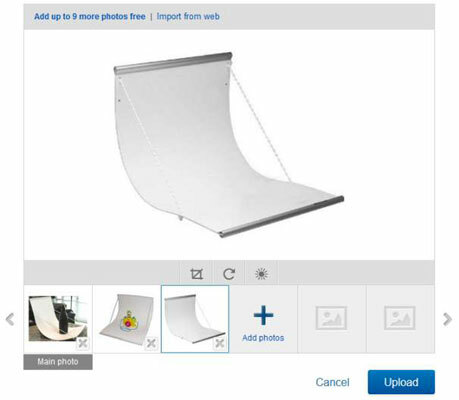 Find and select the eBay-ready images you want to upload. After you select the images from your computer, they will appear in the Pictures area of this window. Click the Upload button at the bottom and (surprise) your pictures upload to eBay’s servers. To get more options — for example, cropping, rotating, and minor editing functions — click the leftmost tab at the top of the window to go to the enhanced photo uploader. In the Standard uploader window, click the Upload button. A window pops up, prompting you to open an image file on your computer. Navigate to the directory that holds your eBay images on your computer. Click the image in the browsing window. The image name appears in the filename box. The selected image appears in the picture frame. To rotate the image, click the circular arrow tool. Click the crop box in the lower center of the larger image. Click the frame on the outside of your image, and move the bar until the offensive area is cropped out. A pop-up window notifies you that your picture is being uploaded to eBay’s picture server. 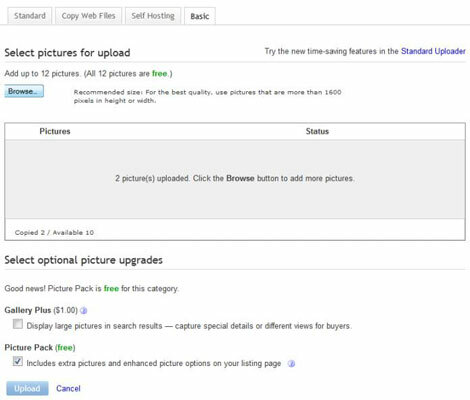 eBay’s uploader tools automatically make your pictures the perfect size for eBay. But don’t forget that you get the best picture quality when you use images with 1600-pixel height or width (minimum is 500 pixels).